On this Saturday, May 18, the opening day of the season, there are indeed protesters outside. Several hundred. And many make it clear that, yes, they are opposed to zoos and aquariums on principle. But dismissing criticisms of Marineland by saying they’re made by fanatical animal liberationists is like dismissing criticisms of Mayor Rob Ford by saying they’re made by socialists who fear an end to the gravy train. There may be broadly competing ideologies at play, but that’s really not the issue. At 9:15 am outside Keele subway station, I hop on a school bus. A couple of dozen activists from Toronto, mostly young women, are ready for a day trip to Marineland, or at least to the grassy strip of municipal land adjacent to its parking lot. After stops to pick up more people in Hamilton and St. Catharines, we arrive in the Marineland parking lot, where we’re not supposed to be. The driver of the chartered bus has insisted on dropping us off at the front, where park guests are unloaded. But because we’re a bus of protesters, we’re effectively trespassing. Marineland recently erected a chain-link fence along the northern perimeter of the lot to more clearly delineate its property. This may have been in response to an occasion last October when a protest climaxed in an impromptu decision to rush the gates and disrupt the flagship animal show. 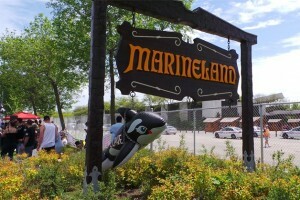 It is therefore especially awkward to find ourselves on the Marineland side of the fence, mistaken for tourists by the hundreds of demonstrators who have already arrived from less far-flung locations. But the Niagara Regional Police, who spend the day overseeing things, are understanding. And a park attendant removes the padlock from a door in the fence, letting us pass through to join the rest of the protesters, who are safely planted on City of Niagara Falls property. It’s a kind of activist fair: tables set up for different groups, tents shading a children’s colouring area. There’s a P.A. system and scores of creative, homemade signs. Some protesters direct their messages through the fence toward those approaching the admission booths. “John Holer has blood on his hands!” is a popular chant, in reference to Marineland’s now elderly owner. 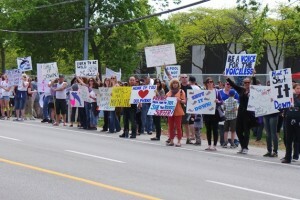 Others line Portage Road, displaying placards to passing cars. The supportive honks are often overwhelming. 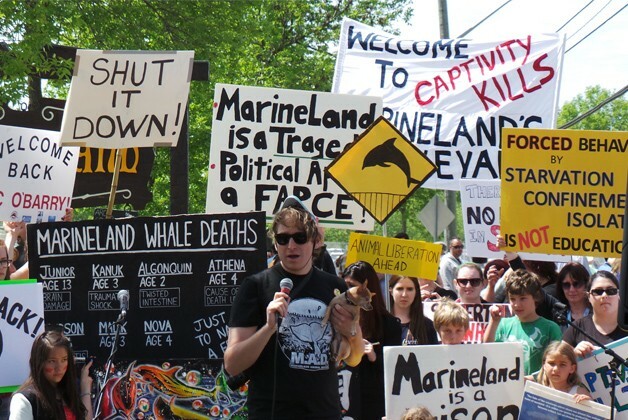 But Dylan Powell, co-organizer of Marineland Animal Defense, which has mounted these protests, is concerned that a regulatory framework might be full of loopholes and only serve to knock out small roadside zoos and not the larger ones. For him, the goal is federal legislation banning the import of live marine mammals captured in the wild. Regular one-day admission to Marineland is $48.55, including HST. As many people as there are outside the park protesting, even more enter through the front gates to the strange world inside. As I punch in my credit card PIN, I hear desperate hollering. The fence keeps Marineland’s customers from getting a clear look at protesters’ signs, but it does nothing to dampen anyone’s voice. The experience of buying a ticket has been made loud, intense and (quite deliberately) uncomfortable. Inside the Aquarium Dome, several seals and sea lions swim circles in a pool. Wistful mu-sic plays through overhead speakers. I see things that – not being a veterinarian – I am not qualified to assess but which nevertheless make me rather sad. When I was last at Marineland, at least 20 years ago, the orcas were the stars of this show. But now Marineland has exactly one remaining, and she resides at Friendship Cove. When I visit Kiska, she’s moving slowly, her dorsal fin drooping. From the underwater viewing area, she’s a lone hulk floating in a cloudy blue void. The protest’s theme is youth voices. Among the speakers are one child, one preteen and one teen. It’s a family event. Even hip-hop artist Darius Mirshahi of Test Their Logik makes a point of keeping his lyrics clean. The fight to close Marineland is based on an issue that’s easily grasped. Reports published in the Star last summer, including the accounts of more than a dozen former trainers, have galvanized an opposition that had previously moved in ebbs and flows. There is momentum, and it’s crossing into the mainstream. The company did not respond by press time, but in statements posted on its website over the last nine months, Marineland vehemently denies both specific and general allegations concerning mistreatment and neglect of its animals. The facility emphasizes its membership in CAZA and asserts that investigations by that group as well as the Ontario SPCA have found no issues of significant concern. Further, Marineland has commenced legal action against the Toronto Star. Story Book liked this on Facebook.